It was sudden. It was unexpected. I was in 9th grade when my life took a dramatic turn. Like many of my peers at school, I was planning on pursuing electrical or computer engineering at N.E.D. University. My father is an engineer. My eldest brother is an engineer. The path seemed to have been laid out. But then, on a fateful night, Cosmos got aired on Pakistan Television (PTV). By the time the first episode ended, I had decided to become an astronomer. 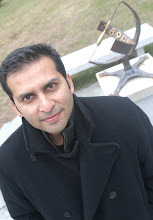 In less than an hour, a science poet from Brooklyn had fundamentally altered the trajectory of my life in Pakistan! I don’t remember the exact date, but this was some time in 1984. I had heard of neither Carl Sagan or of his Personal Voyage in the form of the show Cosmos. In fact, when I sat down to watch the first episode, I was initially disappointed to find out that it was a documentary. I loved science fiction films, but used to run away from documentaries. I was thirteen. But the name of the show, “Cosmos”, fooled me. It sounded cool and mysterious. The surface of the earth is the shore of the cosmic ocean. On this shore we've learned most of what we know. Recently we've waded a little way out, maybe ankle-deep, and the water seems inviting. Some part of our being knows this is where we came from. We long to return. And we can. Because the cosmos is also within us. We're made of star-stuff. We are a way for the cosmos to know itself. I was hooked. The first episode ended with Sagan’s famous Cosmic Calendar, where the entire history of the universe was compressed into one year. The Big Bang happened on January 1st. In this calendar, the Sun and the planets formed only in September, and life arose on September 21st. Modern humans appear at 11:52pm on December 31st, and the entire written history would lie within the last 13 seconds of the cosmic year. The episode ended, but I remember sitting in stunned silence for a little while. For the first time, I had encountered the true enormity of space and time. My jaw stay dropped for the coming weeks and months, and I was an annoying teenager who was trying to explain the Cosmic Calendar to anyone who would listen (and even listening was not exactly a precondition). I had fallen in love with astronomy. Through Cosmos, I found out that one could be a professional astronomer. This was a revelation: You can get paid to do what you really love to do! Seventeen years after the airing of Cosmos in Pakistan, I obtained my doctorate in astronomy in the US. Carl Sagan died in 1996, and I never got a chance to thank him personally for transforming my life via only a picture tube. I routinely watch clips of Cosmos for writing inspiration. I have the series on iTunes, DVD, and, yes, even on VHS. I want to make sure that in case of a technological apocalypse, one of these formats will allow me the continued pleasure of being awed by Sagan’s personal voyage into the cosmos. Now I await the premiere of the new Cosmos: A Spacetime Odyssey, hosted by Neil deGrasse Tyson. By all accounts, it looks dazzling. Tyson, himself, is an outstanding communicator of science and a worthy successor of Sagan. I’m excited to see this updated Cosmos. So much has happened in astronomy since the first Cosmos. Planets around other stars. An accelerating universe. Dark Matter. Dark Energy. But in all honesty, I’m also a bit apprehensive. 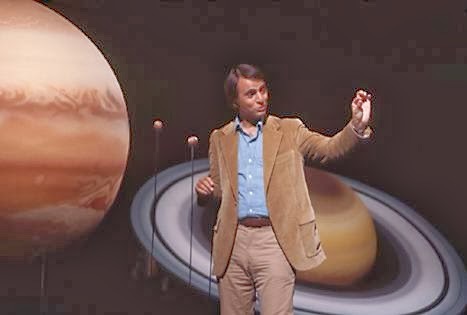 Sagan is often portrayed primarily as a science communicator. But I think his biggest contribution was to provide us with a rich and sensitive humanistic view of the universe. He managed to balance awe and humility in the face of the enormous cosmos uncovered by science. I hope the new Cosmos finds a way to retain this spirit. Wow. That is just fantastic. I have been trying to convince my girlfriend for some time of the magnificence of Carl Sagan's Cosmos - sadly to no avail. Now I have just given up doing it on my own and just forwarded her your piece. Thank you, sir.